The 2014-2015 ArtLink program has officially launched! Earlier this week, Creative Connections’ staff members worked diligently to match all participating classes with their International partners, paying attention to students’ ages and specified teacher country preferences. Once all the classes had been matched with their partner classes, teachers were notified via email about their partnership and provided with a partner profile. This partner profile provides information about the classes’ international partner, with the name of the partner school and the contact information for the partner teacher, as well as the class size and age of the students. 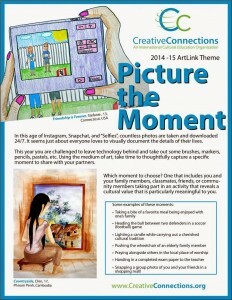 In addition to the reveal of their partnerships, teachers receive an access link to Connections’ 2014-2015 Artlink Teacher Handbook which, for the first time, is available in a digital format. With the handbook, teachers receive program overviews, necessary program instructions and lesson plans with relevant worksheets that will be used throughout the program year. We are very excited to see this year’s program up and running and look forward to the coming interactions with our ArtLink program teachers and participant student artists!